Some 600 million years ago the UAE Gulf coast area was hot, arid, barren and the atmosphere was less pleasant than today. The hard crystalline rocks of Arabia were gradually being covered by a gravelly desert and inland 'sabkha' where salt, dolomite, and gypsum accumulated among mauve and purple shales, siltstones and sandstones and green-grey sands, ochres and dark red brown iron deposits. These ironstones often cemented together angular desert gravels. The Earth's crust was fairly unstable and volcanoes were active nearby. Lavas flowed among and onto these sediments and some magma was injected into them. The sequence of salts, sediments and lavas are called the Hormuz series and are of earliest Cambrian age. These were gradually buried under desert sandstones (similar to those forming today) and limestones from an ancient tropical sea. Over the next few hundred million years the great continent of which Africa and Arabia were a part slowly drifted around the surface of the Earth. The UAE seldom strayed from a warm tropical or sub-tropical position south of the Equator. During this time the land sank and more limestone and 'sabkha' deposits accumulated, burying these ancient salt deposits deeper. This weight or overburden of sediment put the salt deposits to sufficient depth and under great pressures until they became warm and mobile. Triggered off by earth movements, probably some 150 million years ago in late Jurassic times, the salt migrated upwards along faults and other paths of weakness, pushing up and rupturing the overlying limestones. Salt columns move up in pulses at uneven rates. Sometimes barely moving, at other times they may rise as much as 50 metres per million years. 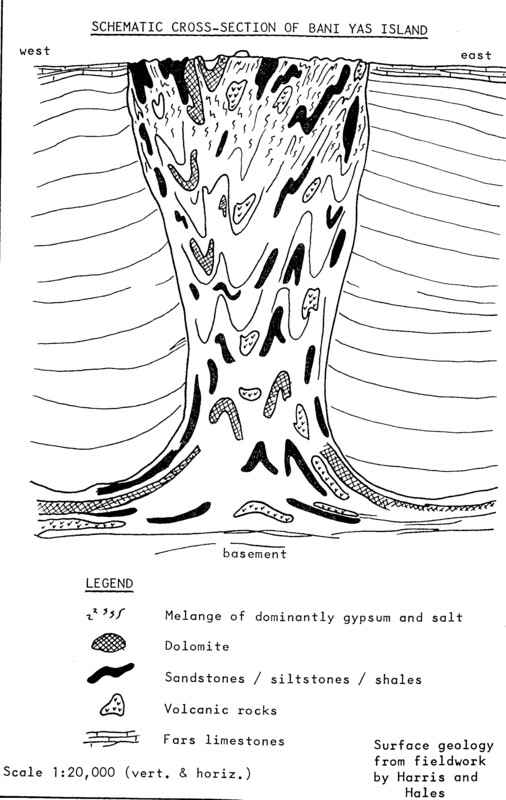 After a prolonged surge in late Cretaceous times, the salt column neared the surface and in early Tertiary times formed a local sea floor hump. In Miocene times, approximately 15 million years ago, as the layers of sediment accumulated, they all thinned over this hump. Then in late Miocene times the pillar gave a gentle upward surge of movement, and arching up these (Lower Fars) sediments. They were rapidly eroded but two small rafts remain on the tip of the salt dome within the mountains on Sir Bani Yas. Today the original salt layer is probably more than 6000 metres below sea level and the column of salt reaches from there up to the surface. It is about 3000 metres wide and has penetrated the topmost layers of sediment- forming mounts up to approximately 150 metres high. 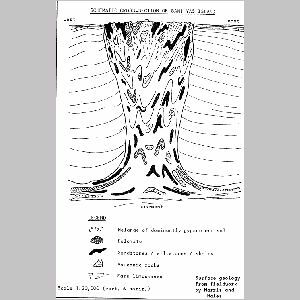 When the salt reaches the surface it is mostly dissolved -- a small salt cave exists on the island today -- but the associated sediments, often rocks and minerals which have been brought up from the great depths within the salt, are left as an insoluble cap. These insoluble rocks form hills of beautiful colours -- mauves, greens, yellows, reds and oranges. The salt pillar mountains are composed of masses of gypsum, sometimes crystalline, sometimes as amorphous mats. Although gypsum is normally a colourless or white mineral, contact with the iron has tainted it yellow-orange-red and deep brown. Iron ore is also common. It is a type of haematite (Fe2O3) called specular iron ore. It occurs as flaky or platy crystals of a brightly shining, metallic-looking, heavy mineral. The flakes break off easily and frequently form a glittering, sparkling blanket along the narrow wadis among the mountains. Areas of green or mauve shales, siltstones and sandstones and of very rotted dolomite and of yellow ochres are commono Hard crystalline volcanic rocks, particularly feldspathic lavas and porphyries, are also present. Small amounts of crystalline sulphur apatite (a complex calcium phosphate), geodes of silica (cavernous nodules whose interiors are lined with tiny quartz crystals or agate) also occur. It is reported that salt used to be mined on the island, as was kohl, a powder made from ground antimony ore and used as an eye-cleansing agent. The accompanying figure attempts to show a simple structural section through Sir Bani Yas Island. The salt and sediments have 'squeezed' their way to the surface contorting and fracturing the overlying and adjacent rocks, and ruptured and folded themselves in the process. The mountains on Sir Bani Yas are surrounded by a fringing blanket of rubble -- boulders, pebbles and gravel brought down from the mountains by the rains of the wetter post-glacial periods. This in turn is covered and fringed by modern beach sands. The currents dive southwards and over the years have drifted the sands into southwards fringing spits, as near Dasah. The southernmost tip is formed of a series of such spits giving the island an inverted teardrop shape. This island is just one of a series of salt domes stretching northwards from Jebel Dhanna to Bani Yas and Dalma Island. Similar islands in the Gulf include Sir Bu Nu'air, Zirku, Das and Qarneyn. Sir Bani Yas is now the private island of His Highness Sheikh Zayed Bin Sultan Al Nahyan, President of the UAE. Here he is testing different strains of fruit in his orchards to see which grows best in this area. He also has areas protected for several species of gazelle and other groups of animals on the island.